Out of the box, the 436M6 packs an intriguing feature set. It’s one of the first PC monitors to be granted full VESA Display HDR 1000 certification. Converting an HDTV into a large-scale PC monitor—which is basically what Philips has done with the 43-inch 436M6—isn’t a new idea, but nor is it necessarily a bad one. In the 1080p era, HDTV conversions had limited appeal; a 2K pixel grid stretched over 40-plus inches of LCD panel made for big, fat, ugly pixels. Today’s UHD or 4k sets, however, have plenty when it comes to pixels. TV tech of late also matches or beats the best monitors in other areas. Thanks to broad adoption of various HDR standards in the mainstream TV market, wider color spaces and supercharged contrast capability is becoming the norm. TV prices also look like amazing value compared to monitors, in no small part thanks to the economies of scale in what is a far larger consumer market. Out of the box, the 436M6 packs an intriguing feature set. 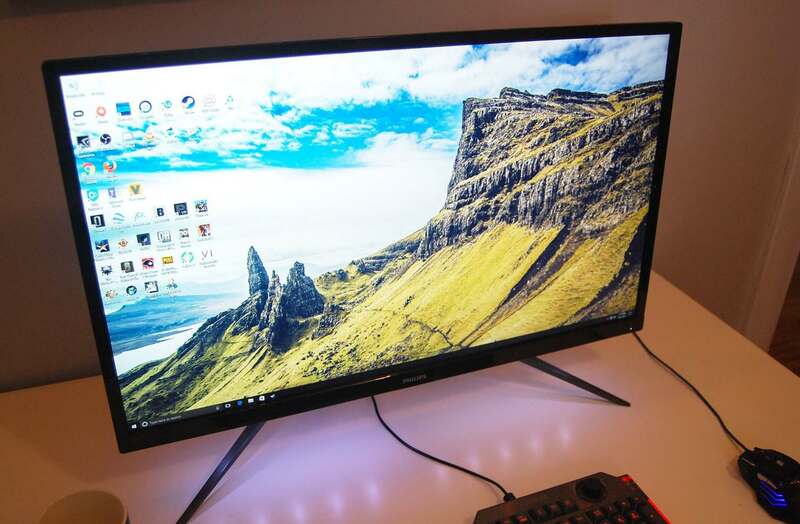 It’s one of the first PC monitors to be granted full VESA DisplayHDR 1000 certification. Among other criteria, that means it must be capable of a minimum of 1,000 nits of brightness, local dimming for heightened contrast, wide color gamut support, including 90 percent of the DCI-P3 space (in fact, it achieves 97.6 percent), and native 8-bit-per-channel image rendering (and 10-bit processing). To that Philips has added some PC-centric extras. Most notable are low input lag, which can be a problem on cheaper HDTV conversions, adaptive sync in the form of aMd’s FreeSync, and USB-C support for single-cable connectivity. Nice. Those additions do not, however, entirely disguise the 436M6’s TV origins. They are obvious from the fixed stand and the fact that you can only access the OSD menu via a recalcitrant remote control. Neither are deal breakers, but you need to be aware that screens like this are less flexible when it comes to desk space. Potentially more problematic is the image quality. We’ll come to the HDR shizzle in a moment, because the first thing you notice is an odd character to the basic image quality. It’s as though colors are being interpolated via a very low fidelity panel. The upshot is a mottled or meshed quality to the image that’s redolent of color newsprint. It’s also similar to pentile OLED displays in smartphones — and for good reason. Instead of conventional RGB subpixel arrangement, this TV-sourced VA panel is ordered BGR, or blue, green, red. That immediately causes problems with anything that relies on assumptions about subpixels, such as font smoothing. The panel also uses a form of subpixel offset or dithering to achieve wider color support. The bottom line is that at normal monitor viewing distances, the image quality is problematic. You just don’t get nice, uniform colors. At a distance, the problem disappears. But that distance is beyond any desktop usage scenario. Of course, if you’re using this as a display purely for playing games in a living room context or similar, it may not be a problem. Certainly, in that scenario, this screen is incredibly punchy. The way specular highlights — the shine from a piece of metal, say — or point light sources leap out of dark game scenes blows away a non-HDR panel. It’s genuinely different and dramatic. It doesn’t make this a great all-around monitor, which it isn’t, but if you’re looking for a big- format display for games or movies, the 436M6 is a spectacular if flawed choice. Incredible contrast; some nice PC-centric features. Oddball subpixel arrangement and color processing.